Continental Drift: steering geometry tech talk « Big Squid RC – RC Car and Truck News, Reviews, Videos, and More! Brian has been bugging me about writing more drift tech stuff, not just he product reviews. So after racking my brain for literally 3 minutes I came up with the first topic for Continental Drift. The name is meant to capture the topic and the huge following that drift is building globally. While many trends still start in Japan, I expect to see this get mixed up in 2017 as people continue to push the status quo. 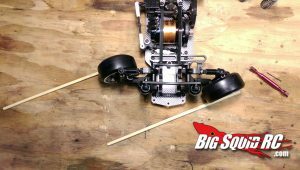 Let’s talk about setting up the front steering geometry of a RWD RC drift car. A few tweaks can lower your rolling resistance to increase speed and bring your fluidity up. To start, get a pair of standard chop sticks. Props to Afro RC for the tuning tip; save your bucks and get a set of chopsticks from your favorite General Tso restaurant. Cultural side note, don’t rub the sticks together before eating – it’s like spit shining your spoon at a nice restaurant. And while some spoons do need spit shining, to reflexively do so is uncouth. Hold the sticks to the wheel to easily see your tuning changes. Protip: install the turnbuckles so that they turn the same way when adjusting – I set mine so that pulling the wrench towards me makes them shorter. This is an example of good steering geometry and decent max angle. Not the most angle of all time (all time!) but a solid performer that did well in our last local competition. 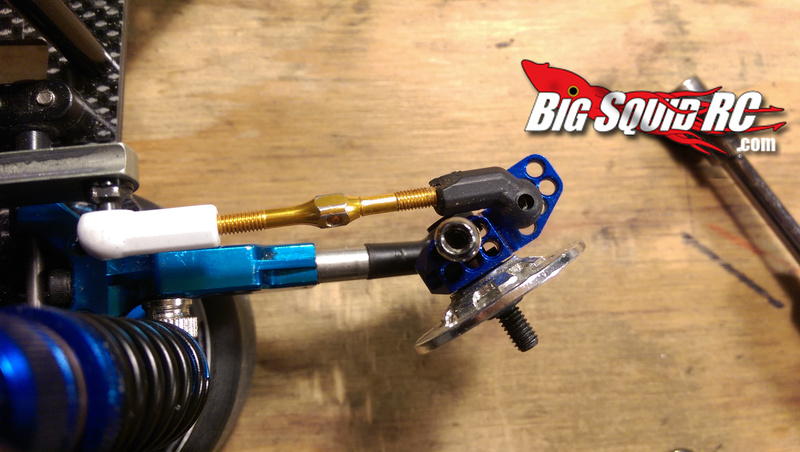 We want to create a free rolling front for going sideways and those brief moments the wheels are straight. The general rule is to run parallel steering through the sweep with some ackerman out at full lock. Positive ackerman at lock can help recover from a spin. 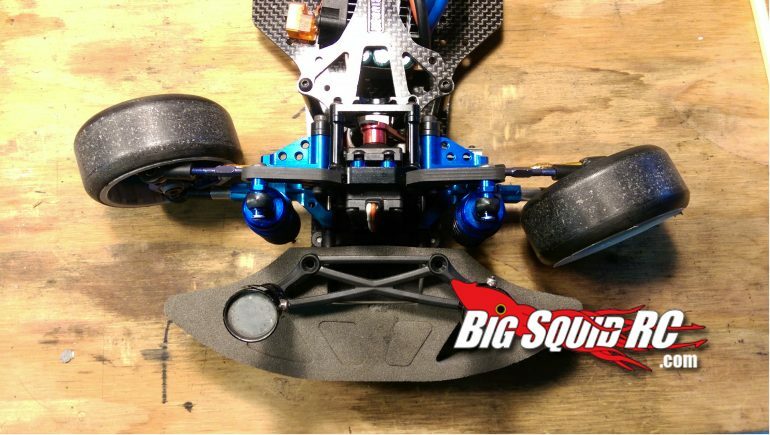 Negative ackerman (where the inside wheel has more angle than the leading wheel) will be slow as the car starts to crab walk as the outside wheel is trying to take a shorter track. This is bad steering geometry – the outside wheel is going to take a much shorter track and will definitely crab walk. If you can’t achieve good steering geometry with turnbuckle adjustment, move to the kingpin, steering rack and steering linkage ball studs. When the knuckle ball stud and the king pin are in alignment, that’s generally lower ackerman. It will take some experimentation and mental gymnastics. 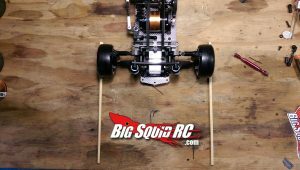 Below is a Wrap Up Next v3 knuckle with Yokomo YD2 ball end cup (part# Y4-207), the curved ball links are a huge help when chasing super extreme drift angle. 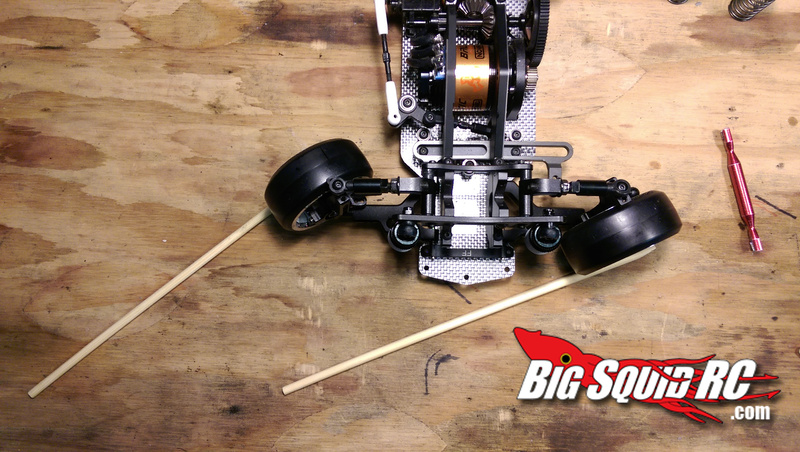 By moving the steering turnbuckle to a wider position, this wheel will have less max angle. Moving the mounting point to the inside hole would give less angle. In either case, you’ll need to tune turnbuckle lengths after every adjustment. After setting your steering sweep and max angle, check the toe setting at neutral steering. Too much toe-out will cause the car to scrub speed as the tires try to drive away from each other, but can help with initiation and making extreme steering angle. A little toe-in can be helpful for stability and speed, but with all things, a little more or a little less is all about your driving style, track and tire feel. Show off your work in the comments and let me know what tuning topics you want to hear about.